As a Baptist clergyman's daughter and a physician's wife, the suggestions for Redfield Pepper Burns and Robert McPherson Black must have come very naturally to Grace S. Richmond (née Smith). She was born in Pawtucket, Rhode Island and educated at home with private tutors. In 1887, she married Dr. Nelson Richmond of Fredonia, New York. 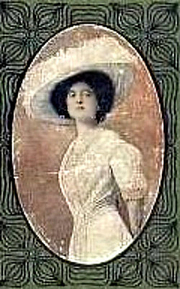 She published her first short story in 1891, and by 1898 was contributing stories to various national women's magazines, including the Ladies' Home Journal. She wrote 27 novels between 1905 and 1936. Grace S. Richmond is currently considered a "single author." If one or more works are by a distinct, homonymous authors, go ahead and split the author. Grace S. Richmond is composed of 6 names. You can examine and separate out names.